SoftBank Group Corp (TYO:9984) announced that they had sold their entire stock in NVIDIA (NASDAQ:NVDA) throughout January that was held through the SoftBank Vision Fund. SoftBank was mostly known for being a telecommunications company in Japan, but after many years of consolidation and acquisitions has become an international giant (read our assessment of the SoftBank Vision Fund here) with subsidiaries such as Arm Holdings and Boston Dynamics, an 85% stake in Sprint Corp and minority stakes in Alibaba Group (NYSE:BABA) and Yahoo! Japan. The SoftBank Vision Fund (SVF) specifically had a total value of $55.3 billion spread over 49 investments, with what was $3.6 billion in NVIDIA. Other companies of note in the investment fund are WeWork, Slack, ARM, and Uber. SoftBank did not disclose whether the fund was either reduced or the money reallocated to other investments; this news will be expected in their Q4 earnings report. We reported yesterday that NVIDIA might have understated cryptocurrency revenue by more than a billion dollars. The fallout of under-reporting the effects of cryptocurrency is that what looked like legitimate and sustainable demand was a temporary boost in profit and now a stockpile of pascal cards that did not sell after demand fell back to normal. Revised guidance for Q4 shows a revenue shortfall of $500 million, with actual earnings expected to be reported February 14th. The combination of cryptocurrency prices falling and RTX cards only addressing the enthusiast market in Q4 have the stock currently trading around $150 as of writing, down from the 52-week high of almost $300 in early October. The good news for NVIDIA stockholders is that the transactions were already completed in January so there won’t be excess supply in the market at once causing the stock to fall further. SVF likely staggered their selling throughout the month to avoid hurting the share price as they were in the process of selling. The bad news is that it shows that a large technology investor is no longer interested in their stock and could signal that they don’t see immediate value from the company. 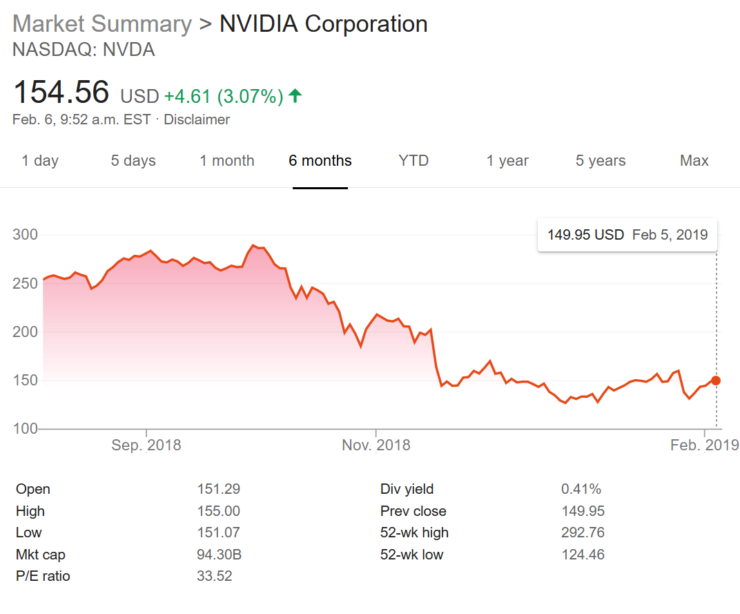 NVIDIA themselves noted that currency fluctuation affected their revenue and softer demand than expected in data center markets would also affect the company. It’s also interesting to note that SoftBank sold off their stake immediately prior to NVIDIA announcing a massive downward revision in their forward guidance for earnings which then subsequently made the stock collapse which is obviously extremely fortuitous timing on their part. With adjusted guidance for Q4 so recently there should not be a lot of surprises left for their earnings report, future guidance and actual sales figures for Turing based cards will likely be the most important aspect for NVIDIA in the near term if they hope to raise their share price and institutional favor. AMD (NASDAQ:AMD) posted an excellent Q4 despite the “crypto hangover”, and their stock price has risen as a result, they are also expected to introduce mid-range cards this year that are expected to compete with the recently released RTX 2060 and rumoured 1660/1660 Ti.